This article is written by Senior Boiler Tech Justin Skinner. Thanks, Justin. Oil burner nozzles are present in most forced combustion air burners. They are used, with an oil pump, to atomize fuel oil and allow it to burn. Atomizing is raising the pressure of the fuel and forcing it through the nozzle. The fuel comes out of the nozzle essentially vaporized. It is then mixed with air and burned. Nozzles are also used to meter the amount of fuel being used, and to vaporize the fuel in an efficient pattern suited to the burner chamber of whatever equipment it is installed on. If you work on burners, you have probably seen and changed out your fair share, as periodic nozzle replacement is necessary for clean and reliable burner operation. But there is more to nozzles than what meets the eye. Let’s take a closer look. The numbers on the nozzle tell us the specific rating of the nozzle, the spray pattern angle, and the spray pattern type. The nozzle listing here has a .75 GPM rating. That means the nozzle will spray .75 gallons per hour of fuel oil at 100 psi. Nozzles are generally rated at 100 psi, and that is the pressure that most residential style oil burners run at, but not all. It also has an 80-degree spray angle. That is the angle at which the spray comes out of the nozzle. The smaller the angle, the more narrow the spray pattern. Think of a garden hose with a spray nozzle. If you squeeze the handle only a little, the spray comes out at a wider angle. This would be similar to a higher degree spray angle. As you squeeze the handle more, the outer edges of the water get closer together. A closer spray pattern would be a smaller angle. Larger spray angles are generally used for wider, shorter burner chambers, and smaller spray angles are used for narrower, shorter chambers. The letter on the nozzle indicates the spray pattern. Different manufacturers use different letters for the same patterns, so we will use Delavan as the example, as it is the most common nozzle manufacturer I use. Patterns are designated as solid (B), hollow (A), and semi-solid (W). A solid nozzle indicates the vaporized oil is distributed evenly throughout the entire spray pattern. A hollow nozzle distributes more of the oil to the outer ring of the pattern, and a semi-solid is neither. W nozzles are typically considered a replacement for both A and B nozzles, although that is not also the best option. I prefer to replace nozzles with the type and pattern specified by the manufacturer, but late nights and on-call situations do not always allow it. Typically the nozzle is designed to fit the equipment and not the other way around, so using the correct nozzle can save you a lot of headaches and a sooty mess. The pictures above show an exploded nozzle. The back portion is a very small particle filter. It is composed of thousands of bronze pellets fused together. This filter is easily clogged by gunk, so an in-line filter should be used to catch most of the fuel sludge and trash before it gets to the burner. After the filter, a slotted distributor is present. The pressure of the fuel from the pump causes the distributor to spin, and the oil increases velocity inside of the nozzle. The oil is forced through the head of the nozzle, which contains a small hole/tube. The sudden decrease from high velocity/pressure to atmospheric pressure through the tube causes the fuel to vaporize. Once the vaporized fuel leaves the nozzle, it is mixed with air at the burner head and is ignited if the fuel/air ratio is correct and the ignition source is strong enough. 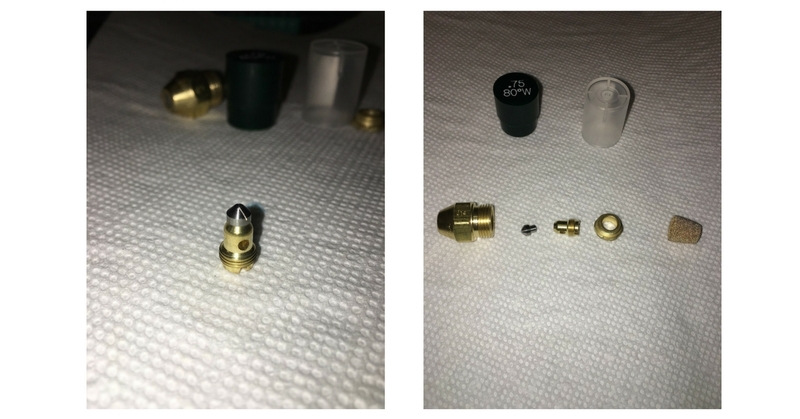 Nozzles are rebuildable if you need to in a pinch. But they are finely machined to exacting specs, and fairly inexpensive. So I would only try to rebuild a nozzle in an emergency situation. Nozzle flow is rated in GPH @ 100 psi pressure. One gallon of #2 fuel oil contains approximately 140,000 (give or take a 1000 or 2). So a 1 GPM nozzle @ 100 psi is a 140,000 BTU burner input. If the burner efficiency is 80%, that means 20% of the fuel energy goes up the flue as unused energy. So a 1 GPM nozzle on an 80 % efficient burner is equal to around 112,000 BTU’s available from the fuel. But what if you need a 1 GPM nozzle, but you only have a .75 GPM nozzle available? Well, increasing the pump pressure above 100 psi can allow for the same amount of fuel input with a smaller nozzle. As the chart above shows, the same nozzle flow rate can be achieved with a variety of nozzle GPM sizes and pump pressures. It’s not advised to change nozzle size or pump pressure during an inspection unless there are issues. It’s more to get you by until you can get back with the correct nozzle. Also, if you change the nozzle size or pump pressure outside of what the manufacturer recommends, make sure you note it on the equipment for the next tech who may go behind you. It’s also an option to downsize the nozzle GPM and increase the pump pressure for hard/smoky light-offs and shut downs. The higher velocity from the increased pump pressure allows for the complete vaporization of the fuel. This allows for a cleaner light off, cycle, and shut down.